Daggerford is fairly quiet for a frontier town. Sure Lizard Men raid the local baron's holding now and then, Orcs sneak out of the Misty Forest to raid caravans on The Trade Way, and Lady Bronwyn has a few suitors who are a touch too passionate, but there's nothing going on that a member of the renowned Daggerford Militia can't handle. Except that the Shining River has turned green, the cattle are dying. Except that the Elf King of Laughing Hollow, a place where no human dares to go without fearing for his life, is asking the militia for help. Except when strange substances are oozing from the fissures caused by a recent earthquake. Except that the earthquake has opened an entrance in the cliffs around Laughing Hollow that might lead to the fabled dwarf mines of Illefarn. The Adventure : This is a module with a dual purpose. The first is to provide a rich setting where starting characters, (0th level characters), can be based, namely the town of Daggerford. The second is to provide a few scenarios for them to get thier teeth into, of which the main one takes place in the long abandoned dwarf hold of Illefarn. As a start point and base of operations it works well. Daggerford is small enough that most things can be at least outlined and big enough to be interesting. Most profession or class trainers are in or near the town and this gives the DM latitude to develop a better sense of a character's history without much effort. This part of the module could be seen as a quasi-source book, and rightly so, but as a background of the adventures in the module. The second part of the module is frankly a mixed bag. 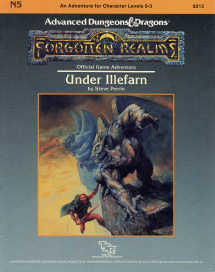 There are a few appropriate adventures, (in terms of difficulty), and then the main feature is an assault on a goblin infested dwarvern ruins, Illefarn. This is a nice idea poorly put together. I felt the need to re-map the entire dungeon as the map is presented in little snippets on each page. By bringing it all together in a level by level map I got a better feel for the different factions occupying the ruins. And there lies another issue, it's not a beginner DM adventure, which is odd because the rest of the module has the benefit of being good for D&D newcomers. Finally it's hard, fighting your way through will result in a quick death. However, on the positive side it's all good stuff and if you are prepared to put some time in then you will get a lot out. You should probably push the PC's up a couple of levels before they tackle the main event. Best Action Remembered : I used the Daggerford setting in this module and one of the adventures as a start to my home grown campaign. The party were members of the militia and the Captain of the Militia, Sherlen Spearslayer, was always hard on the PC's causing them to make many comments out of ear shot. Okay, it's not a specific event but the way i could get her to rub them up the wrong was was very funny. Good Points : Very rich in detail for a party just starting out, the whole of Daggerford is described including possible mentors.